A popular spot for weddings and receptions, Alhambra Hall’s main rental space is approximately 3,280 square feet. The main hall measures 40-feet wide by 80-feet long. The building capacity is a maximum of 350 people. The main hall space can comfortably seat approximately 200 people for a sit down dinner. To schedule an appointment to view Alhambra Hall, please call 843.849.2053. To sign a contract and book Alhambra Hall, please call 843.884.8517 or email AlhambraHall@tompsc.com. Please select dates below on the calendar and fill out the form to book a time. *Holdings are limited to one person. The above fee includes your total rental fee and deposit. The total rental fee is $400, and the required deposit is $700. This total deposit cost includes a $500 security deposit, which is returned upon full compliance with the terms stated with a signed license agreement. The remaining $200 of the deposit is the reservation deposit which is applied to the rental fee, bringing the total out-of-pocket expenditure to $900. The remaining balance is due 30 days prior to your event. . The above fee includes your total rental fee and deposit. The total rental fee is $1,000, and the required deposit is $1000. This total deposit cost includes a $500 security deposit, which is returned upon full compliance with the terms stated with a signed license agreement. The remaining $500 of the deposit is the reservation deposit which is applied to the rental fee, bringing the total out-of-pocket expenditure to $1,500. The remaining balance is due 30 days prior to your event. The above fee includes your total rental fee and deposit. The total rental fee is $1,000, and the required deposit is $1,500. This total deposit cost includes a $500 security deposit, which is returned upon full compliance with the terms stated with a signed license agreement. The remaining $1,000 of the deposit is the reservation deposit which is applied to the rental fee, bringing the total out-of-pocket expenditure to $1,500. The above fee includes your total rental fee and deposit. The total rental fee is $1,500, and the required deposit is $1,000. This total deposit cost includes a $500 security deposit, which is returned upon full compliance with the terms stated with a signed license agreement. The remaining $500 of the deposit is the reservation deposit which is applied to the rental fee, bringing the total out-of-pocket expenditure to $2,000. The remaining balance is due 30 days prior to your event. The above fee includes your total rental fee and deposit. The total rental fee is $3,000, and the required deposit is $1,500. This total deposit cost includes a $500 security deposit, which is returned upon full compliance with the terms stated with a signed license agreement. The remaining $1,000 of the deposit is the reservation deposit which is applied to the rental fee, bringing the total out-of-pocket expenditure to $3,500. The remaining balance is due 30 days prior to your event. The above fee includes your total rental fee and deposit. The total rental fee is $4,000, and the required deposit is $1,500. This total deposit cost includes a $500 security deposit, which is returned upon full compliance with the terms stated with a signed license agreement. The remaining $1,000 of the deposit is the reservation deposit which is applied to the rental fee, bringing the total out-of-pocket expenditure to $4,500. The remaining balance is due 30 days prior to your event. The above fee includes your total rental fee and deposit. The total rental fee is $3,500, and the required deposit is $1,500. This total deposit cost includes a $500 security deposit, which is returned upon full compliance with the terms stated with a signed license agreement. The remaining $1,000 of the deposit is the reservation deposit which is applied to the rental fee, bringing the total out-of-pocket expenditure to $4,000. The remaining balance is due 30 days prior to your event. The above fee includes your total rental fee and deposit. The total rental fee is $4,500, and the required deposit is $1,500. This total deposit cost includes a $500 security deposit, which is returned upon full compliance with the terms stated with a signed license agreement. The remaining $1,000 of the deposit is the reservation deposit which is applied to the rental fee, bringing the total out-of-pocket expenditure to $5,000. The remaining balance is due 30 days prior to your event. The above fee includes your total rental fee and deposit. The total rental fee is $2,500, and the required deposit is $1,500. This total deposit cost includes a $500 security deposit, which is returned upon full compliance with the terms stated with a signed license agreement. The remaining $1,000 of the deposit is the reservation deposit which is applied to the rental fee, bringing the total out-of-pocket expenditure to $3,000. The remaining balance is due 30 days prior to your event. The above fee includes your total rental fee and deposit. The total rental fee is $3,500, and the required deposit is $1,500. This total deposit cost includes a $500 security deposit, which is returned upon full compliance with the terms stated with a signed license agreement. The remaining $1,000 of the deposit is the reservation deposit which is applied to the rental fee, bringing the total out-of-pocket expenditure to $4,000. The remaining balance is due 30 days prior to your event. Thank you for your interest! We would be happy to give you a tour of our historic Alhambra Hall. Contact us at (843) 849 - 2053 to schedule a visit. See you soon! I booked this venue for our wedding reception. It is absolutely gorgeous with wood floors, lanterns hanging from the rafters, and a wrap-around porch. Perfect for a spring/summer wedding! The space has so much potential, and since it is already naturally beautiful, you don't have to go too crazy with decorations. It is also one of the most affordable venues in the Charleston area! We used Alhambra Hall as our reception venue. They were very accommodating with our requests, and allowed us to visit several times during the wedding planning. It is a beautiful space and we were very happy to have chosen Alhambra for our reception. Alhambra Hall was the perfect venue for our spring wedding! Our ceremony was outdoors and the reception was inside... it was WONDERFUL to not have to make our guest travel from ceremony to reception and the backdrop (the water and marsh) was so on point around sunset. The guests loved it! At one point, more people were outside to catch the sun setting on the water than on the dance floor... Inside the reception area upstairs (they do have an elevator) you have beautiful lights and more than enough space. We had 135 guest and it was perfect for all the tables, food, a sitting area, the dessert table, DJ area, and two bars. We LOVE Alhambra Hall... I can't picture our wedding being anywhere else. Do you have a diagram of the Hall? Or dimensions of the Hall? Absolutely. Here is a diagram and a layout of the Hall. Is there a deposit? – What are the fees? – What if I need to cancel? The deposit is $1,500 for residents of Mount Pleasant and $2,000 for nonresidents. These deposits are separate from the Rental Fee. The Rental Fee is due 30 days before the event. Click here for a list of rental fees. How do I get in to view the facility? Contact on-site facility staff to make an appointment (this is different than the booking staff). Can I have a wedding on the grounds? YES, however, the grounds are a public park and are available on a first-come-first serve basis and will remain free and open to the public throughout the entirety of your event. There is no guarantee of exclusivity of use of the grounds. Also, no supplies or furniture are provided by the Town for use on the grounds. Can you mail me a packet of information? Sorry. We do not have packets of information. Hopefully, you will find all the basic information on this website. You can contact the booking office at (843) 884-8517 if you have booking/contract questions, or contact our staff on-site at Alhambra Hall at (843) 849-2053 if you have event setup questions for the Hall rentals. You can view a sample contract for Alhambra Hall here. Can I fill out a rental contract at the facility? No, all contracts are taken at the Business & Tourism Office, Town Hall Complex, Building A, by appointment only. Please click here to view the sample contract. What time does my rental period end? 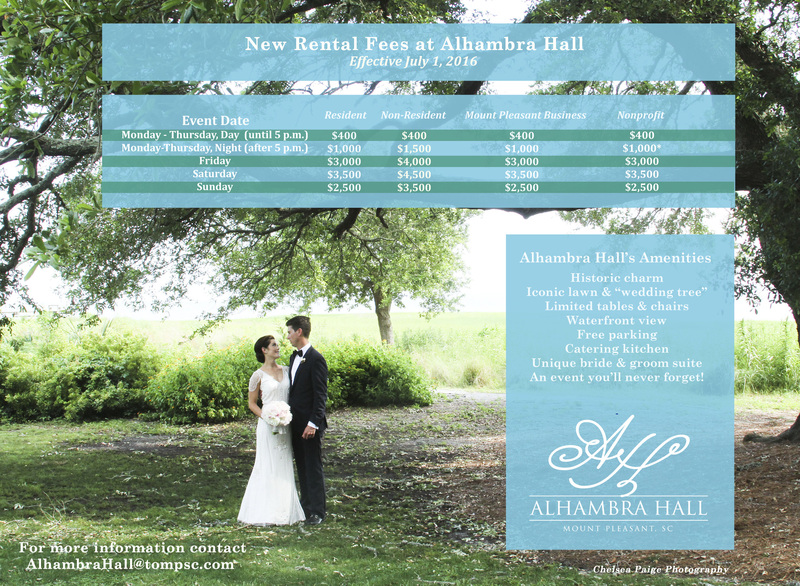 Alhambra Hall – All rentals Saturday through Thursday night end at midnight (12:00 am). Friday rentals end at 1:00 a.m. If necessary, all lights will be turned on fifteen (15) minutes after the stated times, and the clean-up time-frame will begin immediately. The renter has two (2) hours after the event to clean and remove equipment. Lakeside Pavilion – All rentals end at midnight with one (1) hour to clean up following the event. Is there a special rate for Mount Pleasant Residents? Can I book the hall for someone else? We offer a discounted rate for residents booking for their IMMEDIATE family only (parent, spouse, child, sibling). Please see our page about fees and our sample contract for specifics. We cannot make exceptions to the qualifications. Does the Town provide staff to clean up the facility? No, the booking party is responsible for having their catering staff or someone else clean the hall after the event. They have two hours at Alhambra Hall and one hour at the Pavilion after their event ends to perform this cleaning and trash removal. Are the facilities handicap accessible? Alhambra Hall has exterior ramps into the building and an elevator to access the main hall which is located on the second floor. Does the rental include any linens or supplies? No, the booking party is responsible for all set-up needs. A limited number of tables and chairs are included with the rental for inside use only. I’m getting married at Alhambra Hall – where and when can I hold my rehearsal? Please arrange to practice at another location or schedule your rehearsal earlier on your rental day. If you choose to rehearse at Alhambra Park (located across the street) you must stay on the park side and no parking spaces on the hall side are to be used. The hall is booked on most dates. The booking party has use of the hall and parking. A rehearsal would interrupt their event and use of the hall. How do I get to Alhambra Hall? It’s easy! Follow our driving directions! Who do I contact to hire an off-duty police officer for my event? Contact Nan Greer of the Mount Pleasant Police Department at (843) 884-4176! I would like to have alcohol at my Alhambra Hall event. What are the restrictions? The details of the alcohol policy are laid out in the contract. The two most important items are that if you have alcohol on-site, we require a Mount Pleasant off-duty police officer. Second, we require that you hire either a certified license bar service or take out your own liability insurance policy listing the Town of Mount Pleasant as additionally insured. Is there a stove or oven at Alhambra Hall? No, but we do have a warming oven.